The Pirates and Brewers played a wild one this evening in Pittsburgh. Pirates starter Jameson Taillon took a 105 MPH liner to the noggin in the second inning, stayed in, and pitched six innings of five-hit, one-run ball. Hernan Perez—the batter who torched one at Taillon—knocked in both runs for the Brewers. Also, a rabbit got on the field. In the bottom of the ninth, Josh Harrison lifted one all the way back to the center field fence, a few feet shy of a dinger. Turns out, it was enough, since Scooter Gennett overthrew him sliding into third, thus allowing him to waltz into home plate, toss his helmet, and walk off a winner. 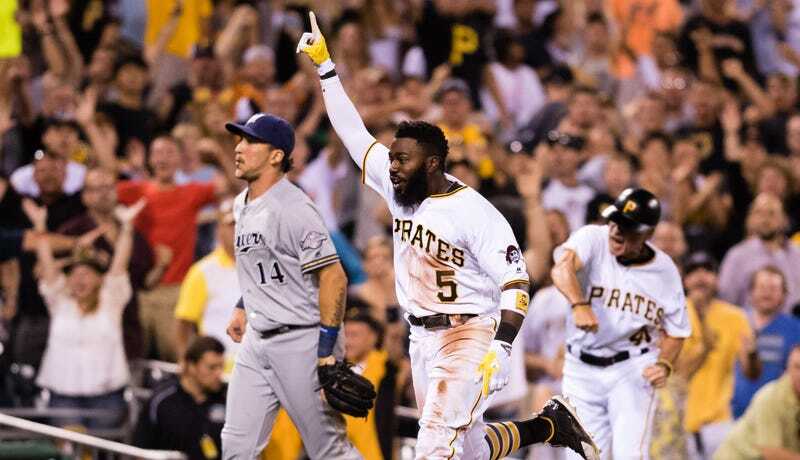 The Pirates are now 14-6 over their last 20, the best in the majors over that stretch.